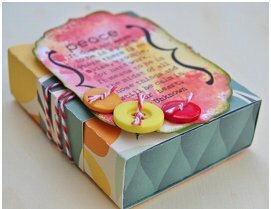 Whether you want to pass along a quote about finding peace, faith, or friendship, what better way to pass it along to a friend, but attached to a homemade gift box from Craftwell. Choose your own design and start making your paper craft boxes. Using the SVG file from SVGcuts.com Crisp Days of Fall SVG Kit, cut out all of the elements of the box on one sheet of 12” x 12” pattern paper with the eCraft. Using liquid adhesive, assemble the box. Wrap twine around your entire box. Tie knots onto your buttons and adhere to your stamped image. Adhere your stamped image onto your box base.